Of course it has to be these places – love them or hate them, most malls have them and the biggest and newest is Fun Works in Yas Mall. As well as loads of rides to try out, they also have a huuuuge five storey soft play house (the biggest around by a country mile) called Wizz Works where kids can let off steam in soft play safety. What’s also unique to Fun Works is the ‘My Works’ workshop concept based around five different themes where kids can get hands on by performing on stage, creating artistic masterpieces, making fun stuff with recycled goods and even learning about energy through firing catapults and loads more. 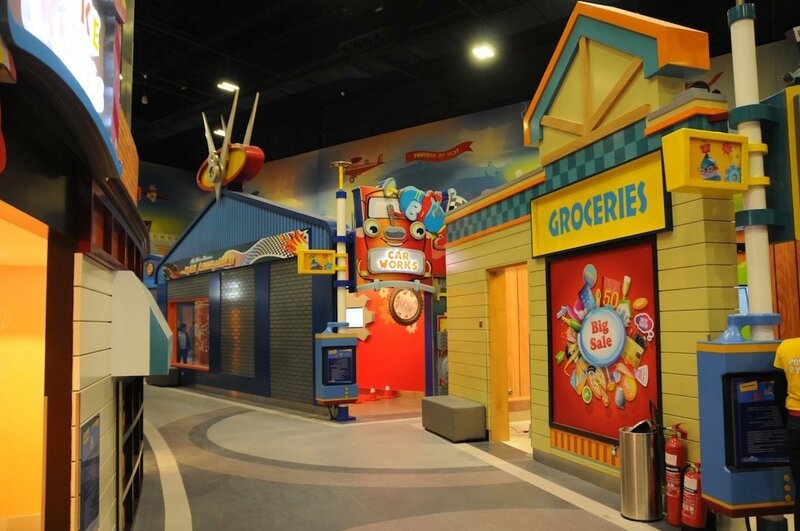 Kidzfactory is housed inside Al Wahda Mall and offers a heap of different things for kids to do in the way of art and creative hobby activities and also offers special themed days too. 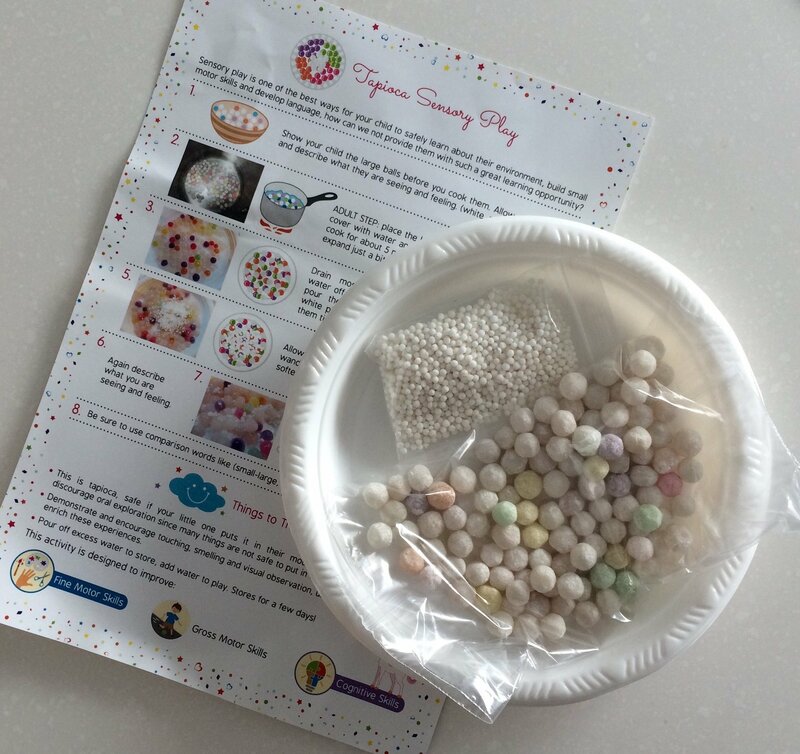 Create your own door hangers, snow globes, collages, try candle making, practise letter writing and loads more. Check out their Facebook page for further details. Wait, what? A park? 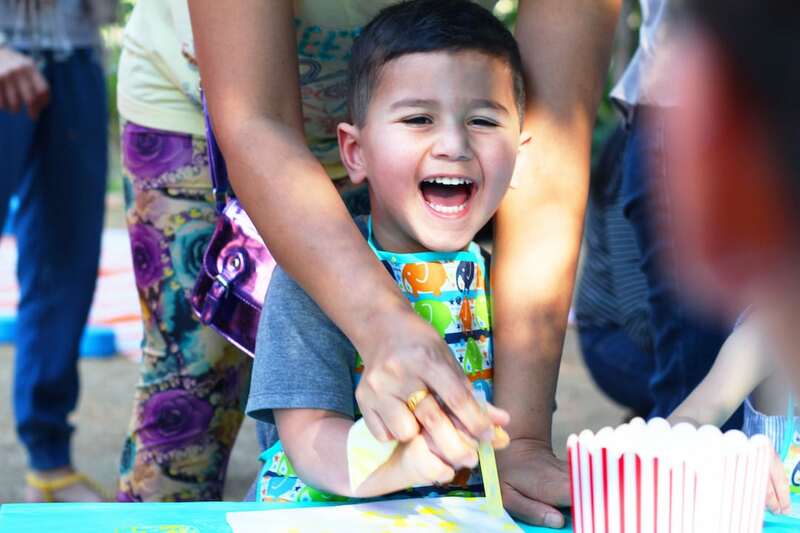 But that’s outdoors, I hear you cry… Well, yes, but the park is hosting a series of indoor kids workshops for the hotter months where kids can try silk painting, building their own gingerbread houses, learn magic tricks and loads more. There’s even a soft play area. Suitable for kids aged five to 12 activities will take place three times a day every Thursday, Friday and Saturday. Sessions will last two hours each and cost Dhs150 per child. For more information check out the park . Over at Yas Mall you can visit the Softair Battlezone to try out their shooting range or course with electronic targets, or play as a team in their Battlezone where teams can play against each other. If you want to stay with the indoor sports for the heat of the summer you can go paintballing, try out the laser simulator or try your hand with a bit of pistol shooting. Get wet outdoors to keep cool with water board and ski sports. There’s also a clubhouse with indoor and outdoor kids play areas. 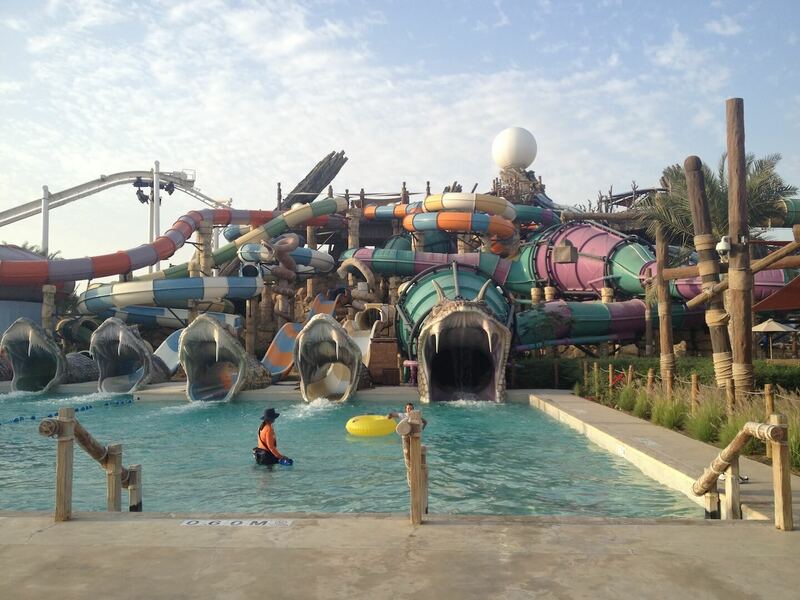 Located at Khalifa Park the main feature is a water play park in shallow water with water guns, tipping bucket and slides. There’s also a lazy river, surf wrangler where kids under the age of 11 can practise their balancing skills on a surf board surrounded by inflatable soft pads and also a bumper boat ride. One of the great things about this place is the price – everyone over 75cms pays Dhs40 to get in, everyone under that height enters for free! People often think that Ferrari World is for adults and men who like cars, but in actual fact this couldn’t be further from the truth as the majority of the rides are family focused and geared towards kids. 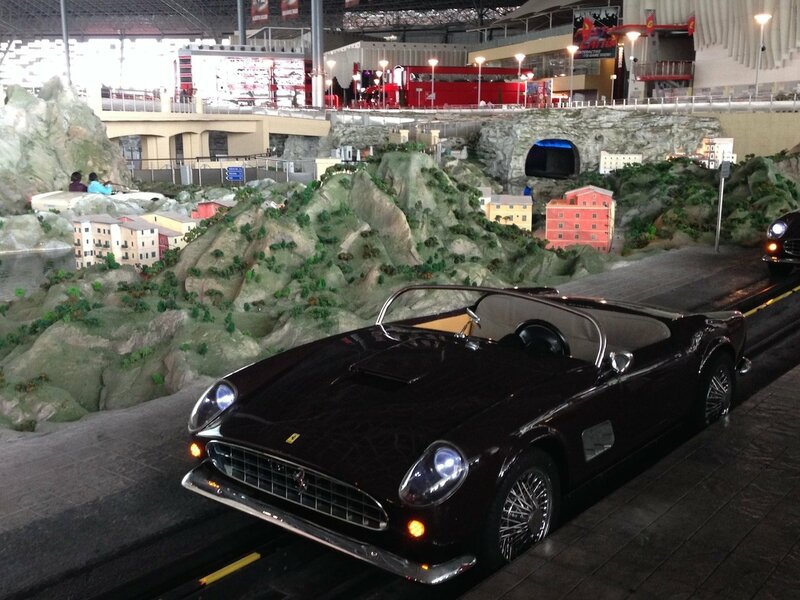 Take a gentle journey around the landmarks of Italy in a small scale 1958 Ferrari or take part in the Junior Grand Prix are just two of the options. Take a look at the post I previously wrote about the park here. Who wouldn’t love this place? Yes, it might seem a little random that it’s in a mall and attached to an outdoor equipment shop, but honestly, it’s reeeally good. There’s a 3.5m boulder wall that offers difficulty levels for all ages – kids under the age of six can take part but must be supervised by an adult, a cable climb that winds its way around the rafters of the store, a super fun trampoline park for kids aged four and up, a skate park for skateboards and BMXs, a BMX pump track and it’s all indoors! It’s really very good and the staff are all very well trained to international safety standards. Captain Tony’s run a whole load of different water based activities where you can feel the breeze in your hair from stand up paddle board tours to dolphin watching and eco tour excursions. If you’re feeling particularly adventurous you can even charter your own boat and go spend a day, or even an overnight on your very own deserted piece of paradise. Is worth a visit for any car enthusiasts young and old. It’s located on the road out towards Liwa but is indoors and houses an amazing wide array of every kind of vehicle you could ever imagine, and some that you just couldn’t make up! If you really want to stay out of the heat there’s always ice skating! There are several ice rinks around the city – Zayed Sports City, Sparky’s at Khalidiyah Mall and Marina Mall. The largest bowling alley in the city is at Zayed Sports City but there are other ones around in the malls too including Marina Mall, Khalidiyah Mall, the Armed Forces Officers Club and also at Abu Dhabi Country Club. There’s also Spacewalk at Abu Dhabi Country Club – it’s the only place to go indoor skydiving in the city and anyone aged three years old and up can give it a go, in groups or on your own! Another crafty find for arty kids and families, Art Beat offers all kinds of arts and crafts activities and workshops for kids and adults. Get your hands dirty painting, clay modelling, glass painting, ceramic painting and loads more. Keep your eyes peeled for the full line up yet to be confirmed, but there are a whole host of activities, shows and events planned including Barney Live, Shaun the Sheep Live, Sesame Street Live, family comedy night, performance troupes and loads more. Events take place at venues all over Abu Dhabi. 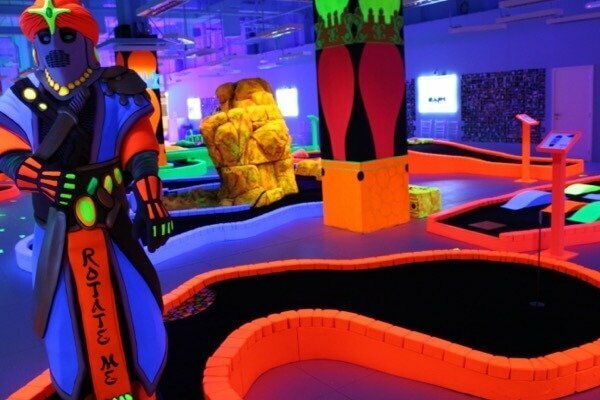 Recently opened in July 2015, there’s now a glow in the dark 18 hole mini golf centreatDalma Mall! Suitable for kids from three years and older, every hole is neon lit and features interactive obstacles to make for an interesting and fun game! The Armed Forces Officers Club has extensive recreation facilities including men’s and women’s gyms, shooting, bowling , football fields, tennis courts and even a martial arts stadium but it’s not all about the grown ups – they are kid friendly and also have two indoor kids pools, both with water slides along with a Children’s Village: a play area for kids with a range of toys, arcade and computer games. The other one in Al Ain which is *really* good, is Al Ain Zoo – again, quite hot during the day but during summer they’re open during the evenings from 4pm-10pm which is well worth going to. It’s actually much better in the evenings as not only is it quieter and cooler, but all the animals are also out and much more active at night time! And, if you’ve exhausted all of these ideas and still need more, what about trying a ‘Happy Box’? The Happy Box are a UAE company that offer kids activity boxes available to purchase individually or on subscription with varying activities and hands on ideas to keep kids busy and entertained each and every month. The boxes are suitable for kids aged two to 11 and every box is customised for the child’s age and gender. An individual box is priced at Dhs250 and further refill boxes can be purchased for Dhs200, or take advantage of one of their subscription options. And there you have it, these are just a few of the things you can still get up to in summer here with the kids when the weather is hot. What’s your favourite summer activity in the city?